It's no secret that a lot of people get into music for the purpose of achieving fame and fortune. For a lot of bands, it's more about getting yourself known than getting quality music made. Despite that fact, there are actually some people who still do it for the sounds, however. 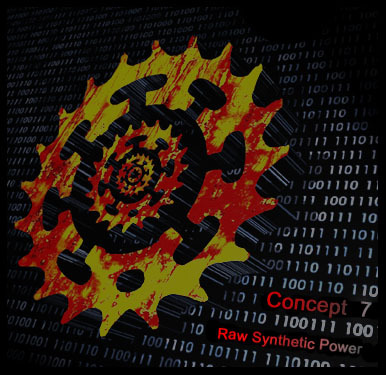 Concept 7 is proud to pursue that ethic, letting their guitar and synth driven industrial tracks speak louder than the band members themselves. Rock Star Journalism: You've been together since 1999; how did the band first become acquainted? Dave: All the members have known each other for many years, and we were all involved in related projects prior to forming Concept 7. Each of us has involvement in other side projects [currently], but the main focus is always with Concept 7. RSJ: Have you always been interested in industrial/electronic music? Who did you grow up listening to? Dave: In the early days, we were all into metal styles of music, but the musical influences vary. Although, in general, we all like and appreciate good powerful music. In a broad spectrum it would cover everything from Led Zeppelin to Meshuggah, with a measure of other styles as diverse as drum 'n bass and ambient. It's this blend of influences and styles that defines where our sound originates. RSJ: Was there a particular artist or recording that inspired you to begin making music? Dave: When we first heard the powerful sound of industrial/metal music we knew that we wanted to be part of that scene. As a kid you didn't get much exposure to the underground styles of music, and the only music you could get was on record. No internet back then! RSJ: How would you describe your sound to someone who has never heard the band? Dave: It's always tricky trying to categorize the style of music we produce. It is interesting to hear what category the fans put our music into, and that generally seems to cover industrial, techno, metal, darkwave and big beat. It's really just a blend of different styles of powerful music primarily driven by guitars, synths and drums. RSJ: There doesn't appear to be much information available regarding the individual band members, as there is nothing on web site or in your liner notes. Is that something you have been intentionally quiet about? Dave: Not really. It's just that we like to let the music do the talking. Concept 7 is more about the music than the people who produce it. RSJ: How do you think your music has progressed since your first release in 2002? Dave: The production has improved. Our music now sounds how we want it to -- powerful and heavy. With the improved production capabilities of new hardware and software we are able to get a better separation on the individual instruments, which is always tough to achieve on heavy styles of music. Especially on guitars. 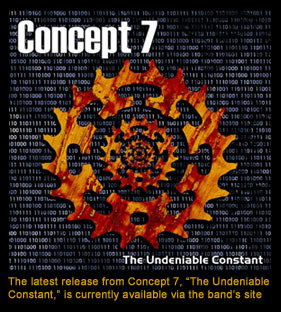 RSJ: How did the recording process work for "The Undeniable Constant?" Did it differ in any way from the method of work on previous releases? Dave: The production process has pretty much stayed the same on all our work. The songs are all written live and then recorded, resampled and chopped to fix any issues. The drums are arranged and recorded along with the bass line to get the vibe going. Then the guitar and synth layers are jammed and added to the main mix. From there on, it is just a case of adding Mark's vocals and mastering the final mixes down. The production techniques and equipment have improved over the years, and this enables us to get a sound we are happy with. RSJ: Is there anything that you think you will do differently on future releases? Dave: Our music is constantly evolving, although it usually remains based around drums, guitars and synths. The main change really is that as the technology continually improves, so do the available production techniques. This means it generally gets easier and quicker to produce quality tracks. Ten years ago everything would have been on tape or DAT; now it's all digital, and it speeds production up to no end. The new stuff we are working on is a little different to our previous tracks, but still as powerful and intricate. We are making full use of some great new kits we have at our disposal, and when it is finally completed it will sound awesome. There are some early demos of the new stuff which seem to have strayed onto the internet, but these in no way represent what the finished product will be, although people seem keen to hear what's coming next. RSJ: What are your thoughts on the current UK industrial scene? Dave: The scene seems very alive at the moment, but with the same underlying issue that the big labels only take music that is "commercially viable." So, like other industrial artists, we end up releasing music by other means. These days, as soon as you release a track or CD, you find it available on websites or doing the rounds on some file sharing software. Although it's good to know that people like the music and are effectively distributing it for us, it makes it a bit tough to keep the books balanced. RSJ: Is there anything you would like to see change in the current music community? Dave: It would be cool if this style of music was more accessible to the mainstream listeners. People tend to think that industrial means noisy so it puts them off before they even hear it. RSJ: Do you have any plans for live dates? Dave: At the moment we do occasional gigs which are posted on our website, but as our music is not in the mainstream, we find the best place to promote it is online and via radio and TV. RSJ: There is a mention on your site that there are two videos being filmed for the new album. Who are you working with for these projects? Dave: The filming for the new videos was done by the guys from Treboursnave. We have a pretty cool partnership going where we do music work for their release, and in return they provide some excellent filming techniques that we compile into our videos. 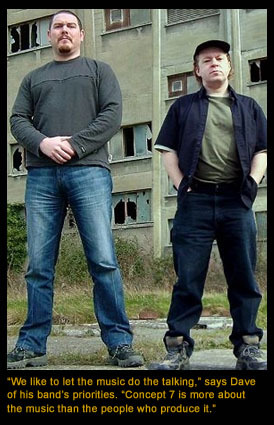 The "Functional Concrete" video was filmed in a disused building, and this really adds to the music. It is currently in the editing stages, and should be available in a month or so. 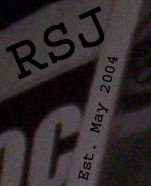 RSJ: Some of your visual material will also be available in an upcoming DVD. Can you give me any details about that? Dave: The DVD is in the early productions stages at the moment but is scheduled for release later this year or early next. It is set to feature all our tracks, videos and other stuff, all accessible via a snazzy interface -- we hope! RSJ: You have a significant amount of visual material available; do you feel that the visual side is as much a part of Concept 7 as the music? Dave: Very much so. The visual medium really adds to our style of music and people seem to take to it more when they can see what we do, as well as listen to it. RSJ: You also produce tracks for television, games and films. What's been your favorite of these side projects? Dave: The most fun to date has to be the work we did for the extreme kiting DVDs -- it was great to put instrumental versions of our work up against the crazy visuals of extreme kiters. It was pretty much the first DVD of its type in the UK and sold by the shed load, which was cool for us. RSJ: I read that you produced a CD for Terminal Curve. In what ways does working on music differ when you are strictly in the producer role? Dave: You have to keep a clear viewpoint on things and remember that you are there to get the artist the best end product you can. We tend to only produce other industrial-style artists. If we produced more mainstream styles of music, it would probably end up sounding too heavy for the artist. RSJ: Having released your material independently, do you find it difficult to get exposure? Dave: Not really. Our music and videos are available in numerous places on the internet, and a lot of our fans come primarily from hearing us on radio stations. We also find that giving away certain tracks free helps our music to spread quicker. Today, the internet has to be the best and potentially easiest place to promote our style of music. A lot of our sales of CDs and merchandise come direct from our site, and it is a good way of generating income and spreading the Concept 7 word at the same time. Promotion via retail outlets and gigs works well, although people seem to be wanting our music in MP3 format for their iPods and the like, and this now accounts for as many sales as for CDs. RSJ: What is the most important goal for Concept 7 at present? Dave: Two things are high on our agenda. To complete the new videos and to crack on with producing the tracks for our next as yet untitled album. We are also currently heavily involved in working on tracks for films that are currently in production in the USA, but as yet we can't say much more!